Washington DC – Here We Come! Did you know that in Washington DC there is a street named for every letter of the alphabet with the exception of “J Street”? (There’s a joke in there for those who are familiar with American Jewish lobbying organizations, but I won’t go there…) In any case, the urban legend is that DC’s designer, Pierre L’Enfant, hated John Jay, who was the nation’s chief justice and therefore left out J Street. However, the truth is that in the 18th century “I” and “J” were almost interchangeable. 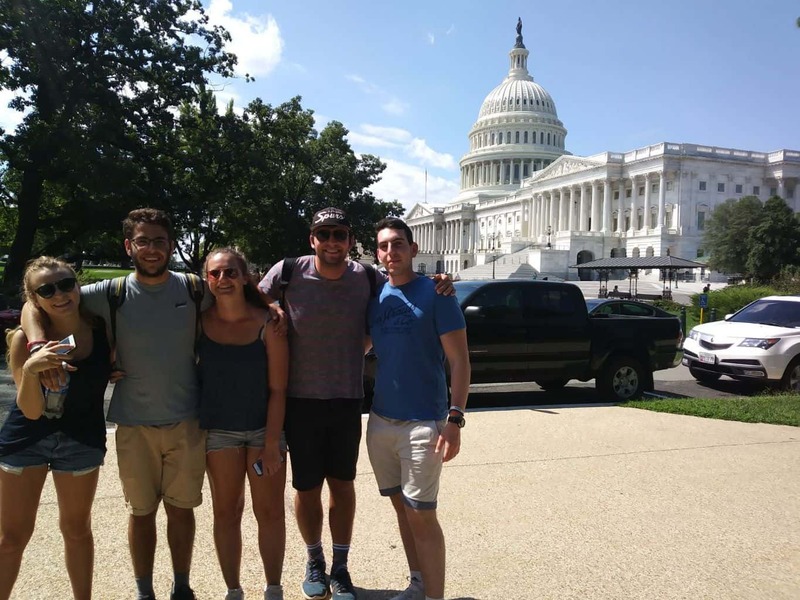 The end of the camp season will be upon us in just four days and the last segment of the Aardvark Plus Program will begin as the students head to the Nation’s Capital – Washington, D.C. We have an amazing itinerary planned for them that can be seen below. Avi Aharoni will be leading the trip. Avi has served on the Aardvark staff as a madrich (twice) and is a member of our recruitment team. In case of any concerns or emergencies while the group is in DC, Avi can be reached at +1-612-423-4454 or via WhatsApp at that number. 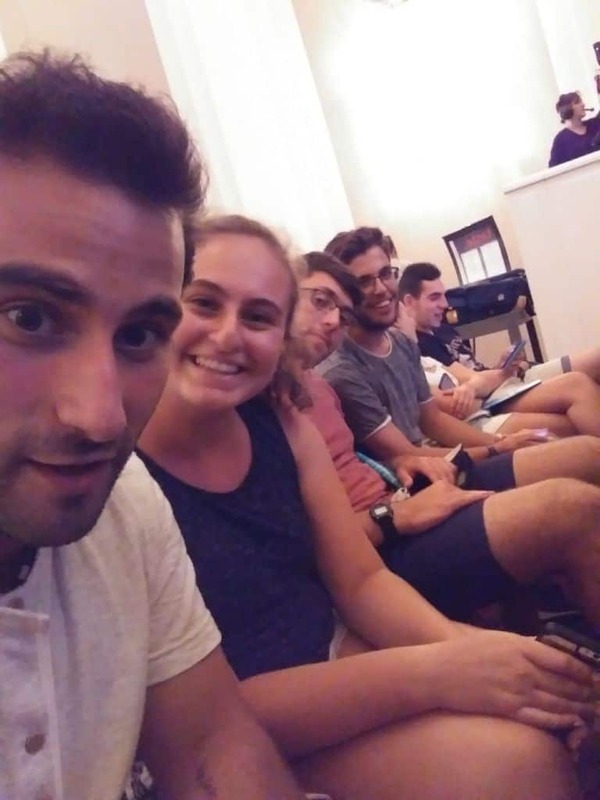 Our staff in Israel will also be in touch with the group so if for some reason you can’t reach Avi, you can always call our offices in Israel. Looking forward to an incredible trip to round off a wonderful summer! 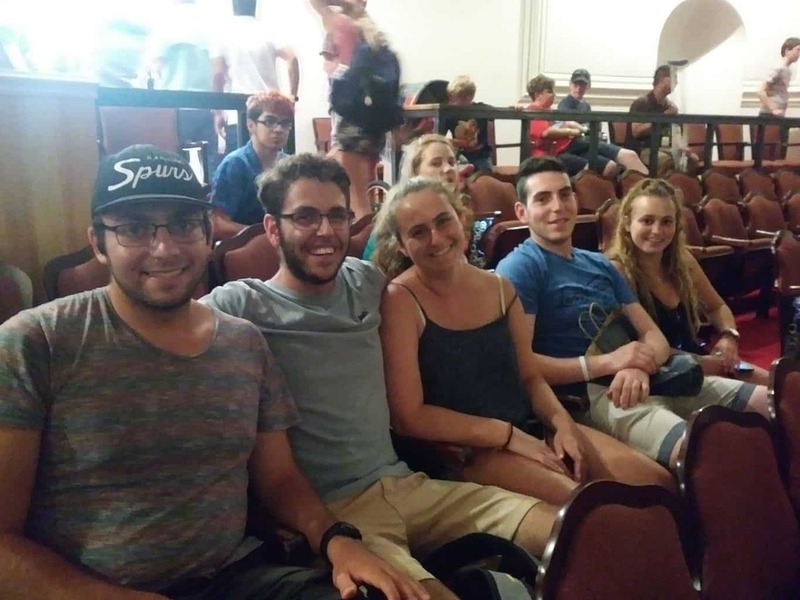 Yesterday the students said goodbye to their summer home in America following an amazing experience at the NJY Camps! 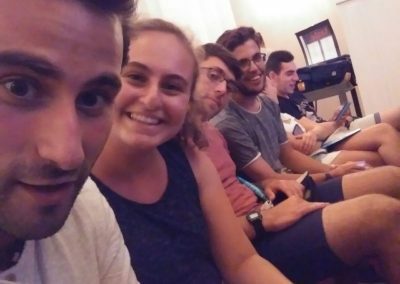 After seeing the campers head home, a private van collected the Aardvarkers and brought them to Newark, NJ where they met Avi who is leading the trip this weekend. Upon arrival at the bus/train station, the students were famished so they headed straight for the food court. The camp food wasn’t bad, but nevertheless they were excited to get “real food” not served in a huge dining room. 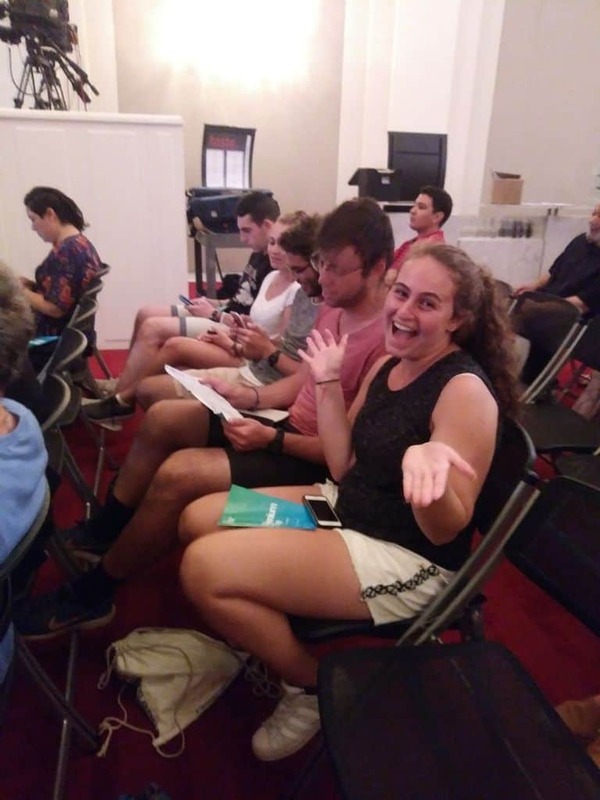 They had some time to relax before their bus to DC departed and they used the time to get to know Avi and to share stories from their time at camp. 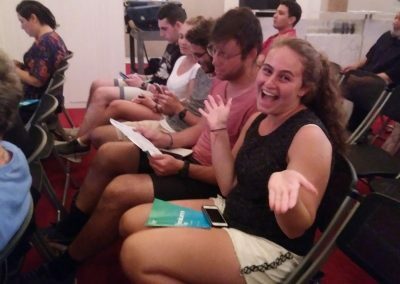 The excitement was visible in each of them as they talked about their campers, their fellow counselors, and the incredible experiences they had. Eventually the time came to board the bus to DC and they were on their way. During the four-hour bus journey they enjoyed the views and apparently no one fell asleep. By the time they reached Washington DC’s Union Station they were exhausted. After a short taxi ride to the hotel, they settled in for a good night’s sleep so that they would be ready to hit the ground running today. This morning their first stop was Starbucks followed by a walking tour of central Washington DC and its array of monuments. We will share more about their adventures with you tomorrow! Friday was an incredible day in the nation’s capital! 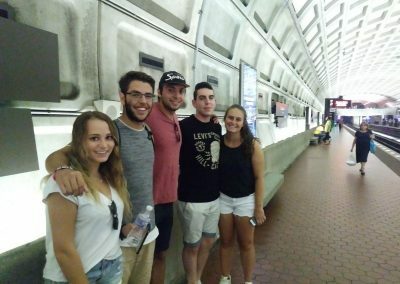 The group headed out on the Metro into downtown Washington to go on a special tour of the monuments. 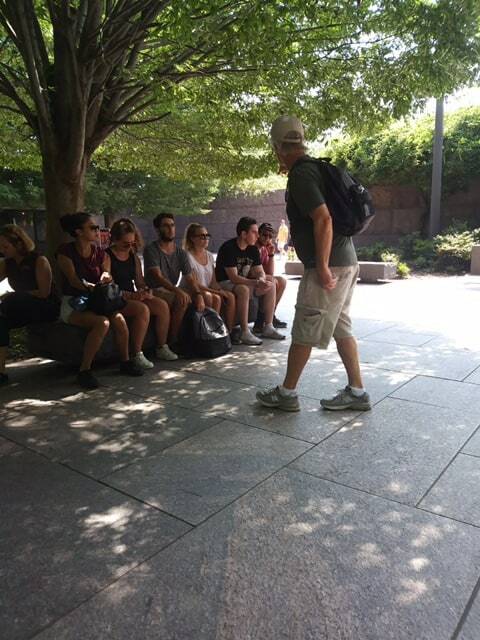 The tour guide, Tim, shared a wealth of information and kept the students entertained with his humor. They began at the Tidal Basin, a partially man-made reservoir between the Potomac River and the Washington Channel. 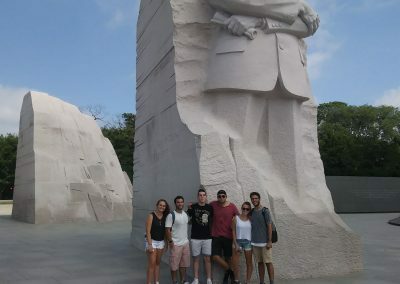 The Jefferson Memorial, the Martin Luther King Jr. National Memorial, the Franklin Delano Roosevelt Memorial, and the George Mason Memorial are all situated adjacent to the Tidal Basin. 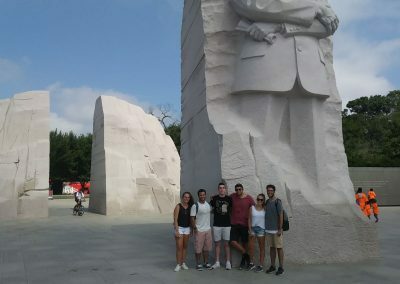 They really enjoyed learning about American history through sightseeing and they were most impressed with the MLK Memorial. After a few hours of touring and walking in the beautiful sun, they headed indoors to a shopping mall to refresh themselves in the air conditioning and to grab lunch. The chance to get in some shopping before the end of their stay in America was also an opportunity welcomed by all. 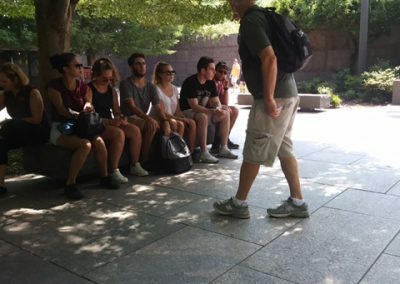 In the afternoon, the students visited the US Holocaust Museum. They found the museum to be very powerful and informative. 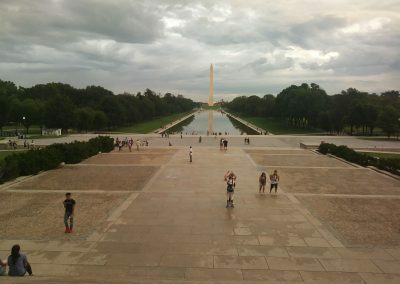 The museum is situated near many of the major monuments and the National Mall. Dedicated in 1993, this museum has had over 40 million visitors, including 99 heads of state, and more than 3,500 foreign officials from over 211 countries. The Museum’s visitors come from all over the world, and less than 10 percent of the Museum’s visitors are Jewish. Given the events in Charlottesville, Virginia last week involving White Supremacists, the message of the Holocaust Museum seemed especially relevant. In the evening, the group made their way to the John F. Kennedy Center for the Performing Arts for a concert. The performance was from a local group and was a fusion of jazz, hip-hop and rap. 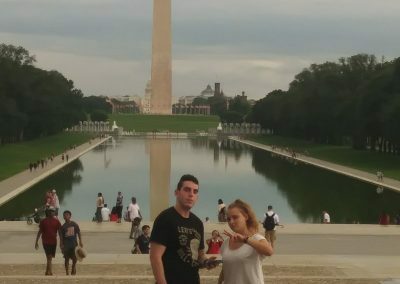 After the concert, they went back to the monuments and watched the sunset from the Lincoln Memorial. 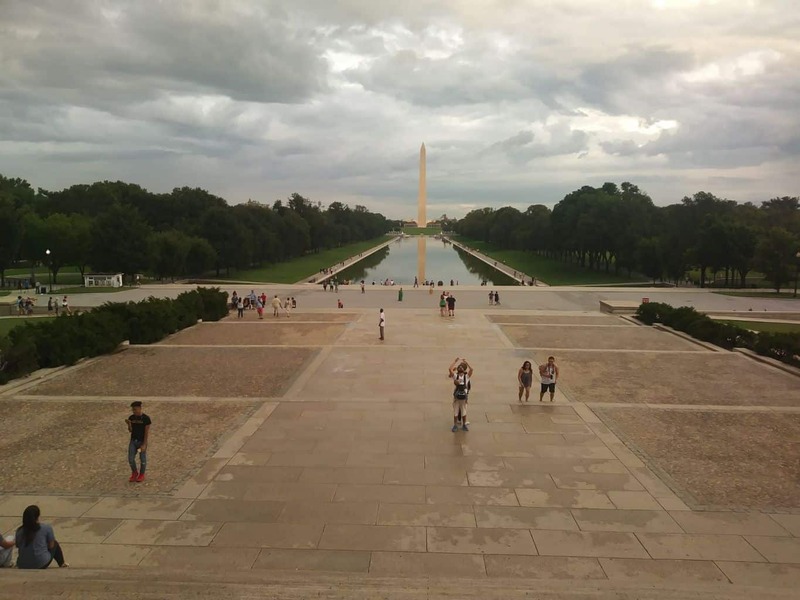 This vantage point gave the students a great view of the Washington Monument’s reflection in the pool in front of it. It was really beautiful and certainly a sight to remember! The serenity of site and the understanding that this was the point where Martin Luther King stood when he gave the “I Have a Dream” speech was incredibly powerful. 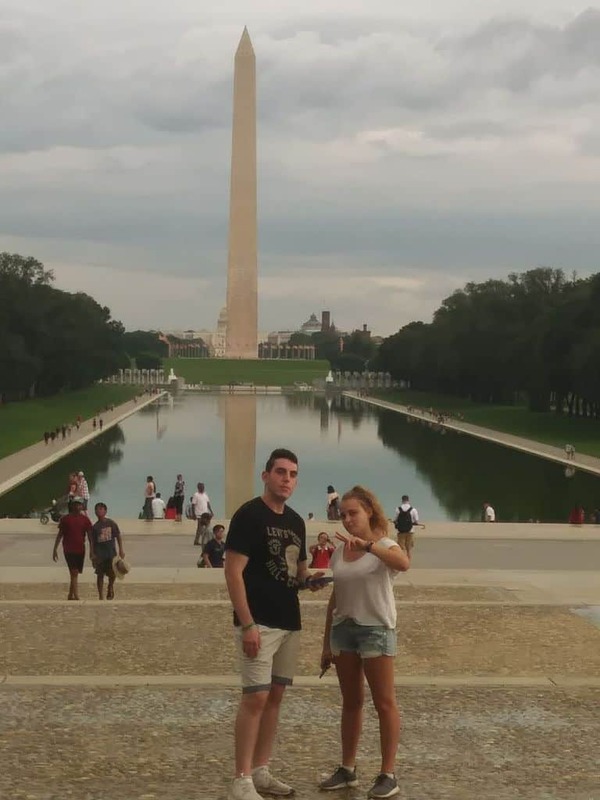 While at the Lincoln Memorial, the group also stumbled upon a couple getting engaged! They were so cute – standing on the steps of the monument, with spectators all around cheering them on. The final stop for the day was an incredible dinner of sushi in the cool Adams Morgan area of town. Joining the group for dinner was another Aardvark participant, Celeste, who lives in the DC area. The students were really excited to see her and they had a great time reminiscing about their time in Israel. 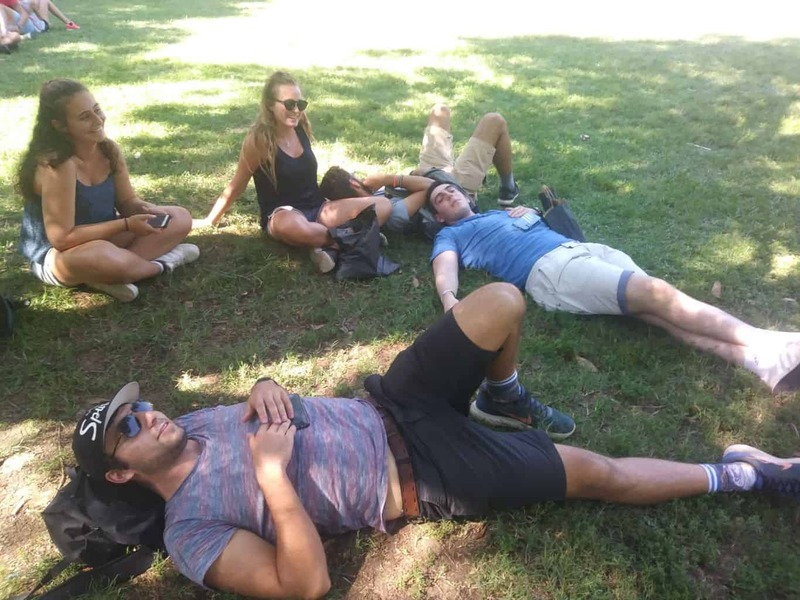 With another two days packed full of activities ahead of them the students finally headed back to the hotel for some much needed R and R. Unbelievably, Avi’s Fitbit claimed that they walked over ten miles throughout the day! The second full day in DC began with a tour of the United States Capitol Building, the home of the United States Congress and the seat of the legislative branch of the U.S. federal government. 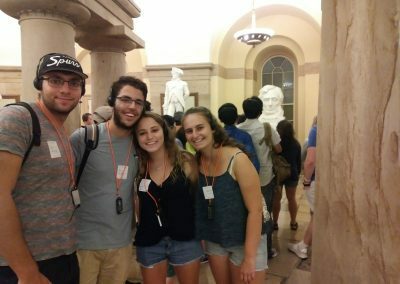 On the tour, the students saw the building’s awesome dome and, through explanations of the many statues and paintings on display throughout the building, learned a lot about US history. 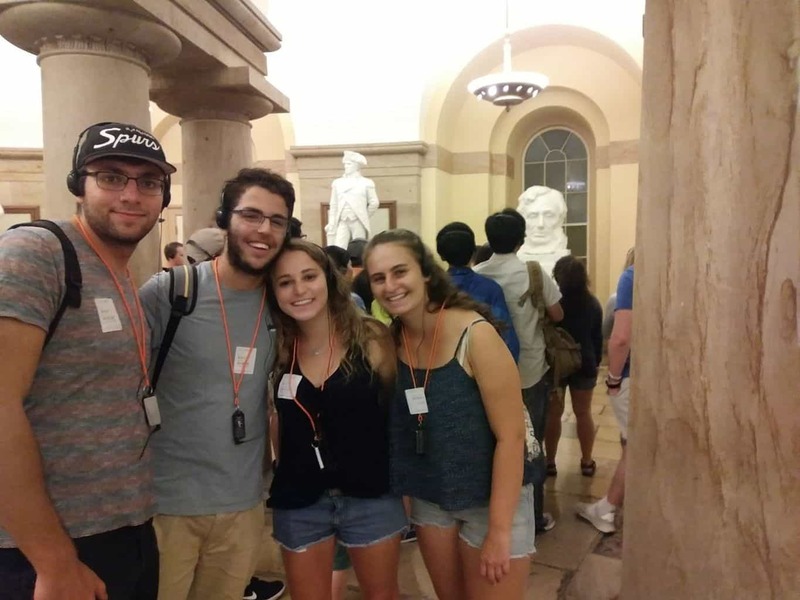 The next stop was the Air and Space Museum and then the National History Museum – two of the many Smithsonian Museums. 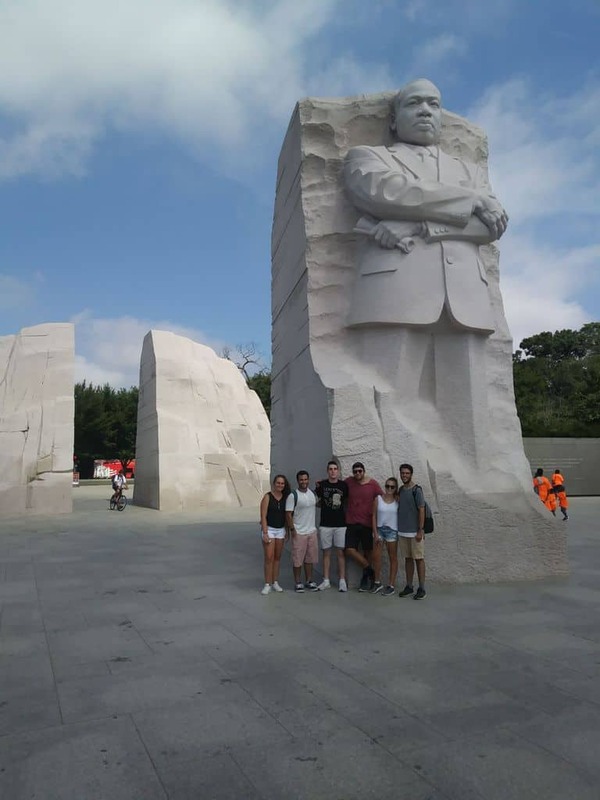 The students had the chance to choose from a wide variety of the Smithsonian Museums nearly all of which are located around Washington’s Mall (which is a huge park surrounded by museums and several of the most noteworthy monuments.) Ricky especially enjoyed the Air and Space Museum. Also surrounding the Mall are a wide variety of food trucks, the source of a great lunch that we ate as a picnic on the lawn. No visit to Washington is complete without a glimpse of the White House. 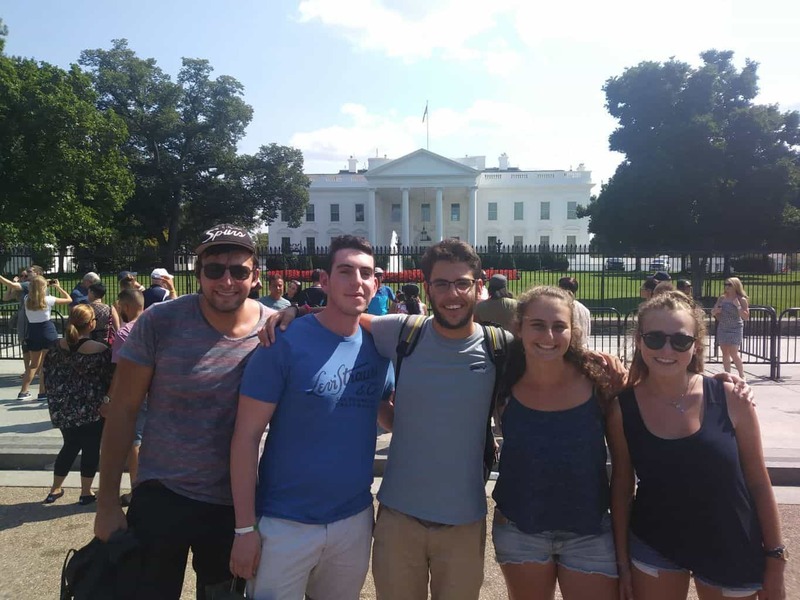 While visiting the home of the President, the students also had the chance to witness some protests and to interact a bit with the demonstrators and hear their perspective. 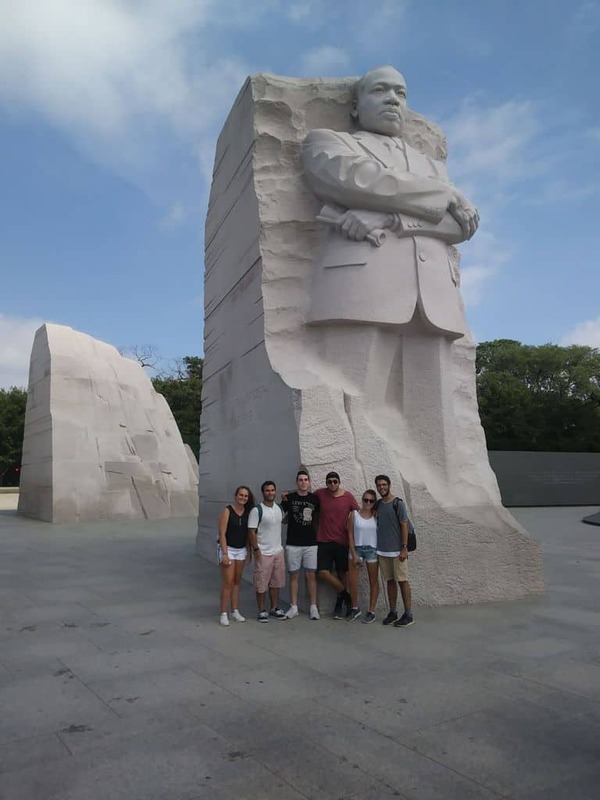 Although Trump was home while our group was visiting, there were no sightings… Sitting in the shade of a nearby tree, the students really had the chance to take in this unbelievable structure and to talk about some of the current politics in America. The focus of the next site we visited was one of America’s most notable presidents. Abraham Lincoln served as the 16th President of the United States. He led the United States through its Civil War, and he paved the way for the abolition of slavery. Lincoln served as president from March 1861 until April 1865 when he was assassinated at Ford’s Theatre. Visiting the theatre gave the group the chance to learn about Lincoln’s life and presidency and to see the actual booth where Lincoln was sitting when he was shot. Limor was a bit disappointed that there was not a performance on the stage as a part of the tour, but the entire visit to the theater was nevertheless informative. The weather during the trip has been pretty hot so at this point of the day the group decided to take a break from sightseeing and head indoors for some delicious smoothies and a dose of AC. The students were still pretty exhausted from all the hard work they did at camp this summer. They have many stories to share from their amazing summer! Moving on, next the group headed to Georgetown, another great neighborhood of DC. 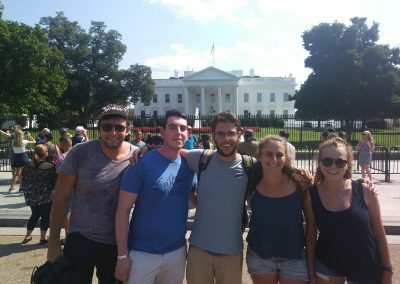 They enjoyed walking around and seeing the area, a part of town that is really popular with college students and young professionals. Washington is situated on the Potomac River and walking along the riverbank, and hanging out on a grassy knoll for a bit, was a really nice way for everyone to wind at the end of the day.